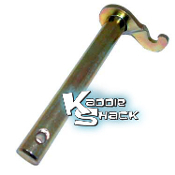 This aftermarket roller pedal replaces the stock pedal assembly. Looks and feels "Old School Cool"! 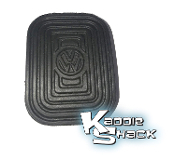 This is a quality replacement rubber pedal pad to replace that old ugly worn out one that's falling apart. 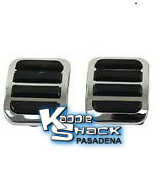 Replace those missing, old, and torn up stock pedal pads with new ones! These Deluxe pedal pads add a unique touch to your interior. This includes the clutch and brake pedals. 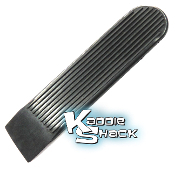 Great for use with a custom roller throttle pedal. These Deluxe pedal pads add a unique touch to your interior. Great for that custom look! This kit contains all the components you'll need to rebuild your accelerator pedal on your early VW: Roller arm, roller, pin, spring, washer, clip. This kit contains all the components you'll need to rebuild your accelerator pedal on your late model VW: Metal pedal, rubber cover, pins, clips, springs, and roller. This kit contains all the components you'll need to rebuild your accelerator pedal on your split window VW bus.